While NASA's Curiosity rover found that Mars could have once supported life at some point in the ancient past, scientists still haven't been able to detect a definitive sign that either single cellular or multicellular life once roamed the Red Planet. NASA officials recently announced that the space agency's new rover set for launch in 2020 will look for evidence of life in the Red Planet's past. Scientists aiding in the development of the rover have said that researchers will have a better chance of detecting indicators of past life on Mars than finding microbes today..
"To go and look for simple organisms, or not-so-simple organisms, that are living within that toxic, harsh environment we just think is a foolish investment of the technology at this time," Jack Mustard, a professor at Brown University and chairman of the 2020 rover mission's Science Definition Team told reporters last week in a news conference. NASA scientists have also recommended that the new rover collect rock samples that can be saved and eventually brought back to Earth on a future mission. Returning samples to Earth will allow scientists to perform advanced experiments with sensitive instruments found in a laboratory. "That [sample return] would be an enormous step forward in our astrobiological exploration of Mars," Cornell University scientist Alberto Fairen wrote in an email to SPACE.com. Some scientists contend that signs of life were already found by the first American lander to touchdown on the Red Planet. Viking 1 — which landed on Mars in 1976 — performed a life-detection experiment that many scientists agree did not uncover life. Recently, some scientists have expressed doubt about those conclusions. Some contend that it is possible that Viking 1 destroyed the organic matter the spacecraft was designed to detect or that its instruments weren't sensitive enough to find the organics the researchers were looking for. "It seems from the results we have from Curiosity and from previous missions and also from laboratory experiments, radiation on the surface of Mars, together with perchlorate is destroying organics down into the subsurface, so we need to get below the level that radiation can reach," about 16.4 feet (5 meters) into the ground, McKay said. Although the instruments on the 2020 rover are expected to seek out signs of ancient life, another instrument currently in development would help search for life signs in the more recent past. MIT researcher Chris Carr and a team of researchers are currently developing a biomarker-seeking instrument. He is betting that life on Mars is distantly related to life on Earth. The instrument analyzes Martian dirt to uncover genomic information left behind by microorganisms that died out up to 1 million years ago. The tool should be able to detect signatures of DNA and RNA on Mars. McKay even broadens the scope of Carr's work. Although strands of DNA and RNA are only detectable for about one million years on Earth, Martian genomic information could last much longer because of the cool, dry environment on Mars. "The sort of processes that destroy evidence of life on Earth over time have not been operating on Mars and so there's a better chance that on Mars we might find something that's a biomarker that's been there for billions of years so the method doesn't necessarily preclude recent or old life," McKay said. "The distinction is not so important on Mars." Impacts from amino acid-laden meteorites from Mars could have seeded life on Earth, making it possible that organics on the Red Planet and Earth could be related, Carr said. 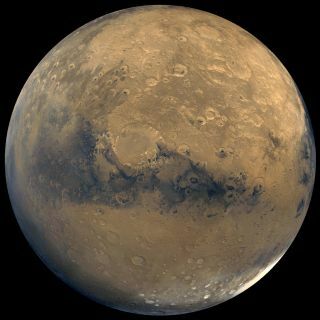 "If there's life on Mars, it could be related to life on Earth due to meteoritic transfer between the planets, and this would have largely happened on the order of 3 1/2 or more on the order of 4 billion years ago during a period called the Late Heavy Bombardment, when there were many large impact events," Carr told SPACE.com. "These impact events transferred on the order of 1 billion tons of rock between Earth and Mars largely from Mars to Earth." Any life-detection experiment would need a few safeguards to be sure that Earth microbes don't contaminate a Martian sample. "Currently, planetary protection allows microbes on the spacecraft," McKay said. "Curiosity is estimated to have flown to Mars with half a million Earth microorganisms on it … but if I was doing a life-detection experiment, those guidelines would not be acceptable." McKay said he would want hospital-level sterilization for any rover attempting a life detection experiment. The entire robot wouldn't need to be sterilized, however. Only the instruments performing life-detection investigations would need to be rigorously guarded.